Many provide training and qualifications. We empower people with the capability to help their organisations reach the highest standards, maintain compliance and drive efficiency. We are renowned for a fast paced, practical, real world approach. A combination of theory and practice that works. That’s why the likes of CRH, eBay, Glanbia, Kerry Group, Medtronic, Musgraves and Pepsi trust us to train their people – over 50,000 in 25 years. Change is inevitable. How we respond determines whether we succeed or fail. We give you the knowledge, guidance and experience to help you succeed. The capability to respond to new legislation, new standards, more competition, a change in customer needs, new technologies or to meet new targets. The capability to make a difference. One of the biggest challenges for learners is to bridge the gap between the classroom and the workplace; to put the theory into practice. We all learn best by doing, so putting theory into practice is an integral element of our courses. Learn, do and review. Our purpose is to increase your capability and ensure you gain the best possible qualifications. Our learners undergo rigorous examinations to achieve recognised, prestigious qualifications. We are QQI (formerly HETAC & FETAC) and NEBOSH accredited. We also provide IRCA, IEMA, AEE, CIEH and ICEB accredited programmes. 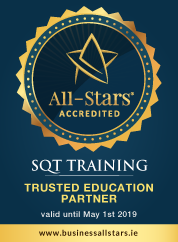 We are a training partner rather than a provider of courses. We seek to make a significant and measurable contribution to the organisations we work with. Since 1989 we have helped our clients implement effective new systems, pass third party audits, maintain certifications, reduce costs and eliminate process inefficiencies. Real problems. Measurable results. Get qualified. Be capable. Progress. Get the capability, knowledge and confidence you need to maximise your potential. Enhance your career with globally recognised qualifications from a highly respected trainer. Get the correct skills and the latest knowledge first-hand, from experienced industry leaders. Capability to shape stronger, smarter organisations. We empower your people with the capability to enhance systems, reduce risks, minimise waste, streamline processes and ultimately improve your organisation’s bottom line. We give your people the capability and the confidence to drive innovation; improving products, services, systems and your customers’ experience. Sharpen your competitive edge. The latest approaches, information and insights to enable your people to discover ways to do more with less. All for a leaner, fitter, stronger organisation.